Dive Journal: Another serious day of diving is ahead, no two ways about it. Our morning activities include loading up the van with eight air tanks and all the dive gear. We also take a few minutes to cancel our Town Pier boat dive reservations with the Sand Dollar and we instead decide to go on a privately escorted dive with divemaster Joao tomorrow night. Piling into the van, we travel north on an exploratory trip, seeking out potential shore dive sites. As a target, we've got a dive site called "Witches Hut / Karpata" in mind. It's raining steadily, and often the rain turns into a downpour. We stop at several sites, including "1000 Steps" and "Rappel". The pathways to the beach are passable but the rocky entries appear to be moderately difficult. We continue north, but unfortunately the road makes a strange transformation into a one-way road, heading south only. We necessarily head inland, and soon find ourselves driving through the town of Rincon on an uncertain course. We change our plans and decide to head south. It's a long drive, but we make the trip from Rincon down through Kralendijk and finally to "18th Palm," the beautiful beach site where we had lunch on Tuesday. It's already 1PM, and so we suit up and get negative in a hurry. 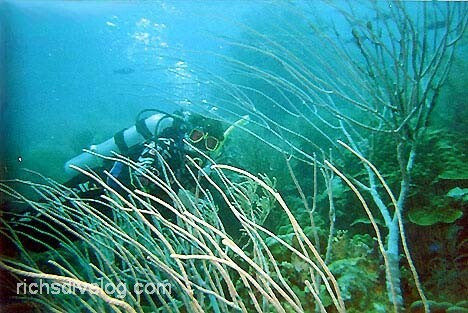 It's another idyllic Bonaire shore dive, an easy shore entry with a sandy bottom plus a few large submerged rocks. At 18th Palm, we see a number of Flamingo Tongues again - very strange critters. There is also a plentiful garden of elephant ears at lower depths. As we descend over the reef slope, I notice that Linda and Mercedes take off in a particular vector downwards, and so Myron and I stop short a bit watching them. Linda comes back up from the bottom holding up her computer and grinning - an official 1st 100 foot dive for her! On this dive, we decide to do some clowning around with various acrobatics stunts underwater, including space flips and various other zero-g "positions." We then explore the reef nooks and crannies, and I especially enjoy the clouds of blue and brown chromis that engulf us. We also spy several excellent spotted scorpionfish, which can be difficult to pick out among the reef rocks. We're in the water almost an hour here.